The classic ingredient to make the Kiwi Dip. Made in New Zealand. Make sure to add to a can of Nestle Reduced Cream to make the famous New Zealand Onion Soup Mix to create the ultimate Chip Dip. The recommend recipe for the dip is – Mix 1 packet of Maggi Onion Soup with one can Nestle Reduced Cream and one teaspoon lemon juice or vinegar. Cover and chill for 30 minutes before serving. Magi Onion Soup is the classic ingredient to make the Kiwi Dip. Made in New Zealand. Make sure to add to a can of Nestle Reduced Cream to make the famous New Zealand Onion Soup Mix to create the ultimate Chip Dip. 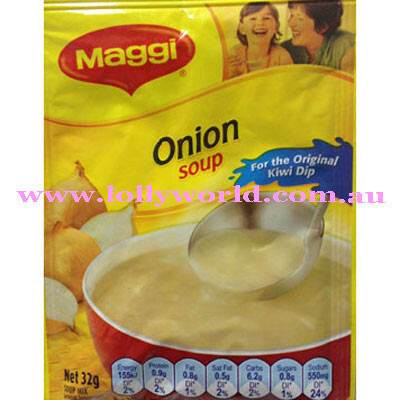 The recommend recipe for the dip is – Mix 1 packet of Maggi Onion Soup with one can Nestle Reduced Cream and one teaspoon lemon juice or vinegar. Cover and chill for 30 minutes before serving.